This week marks some exciting news for all you Petro-Points members out there - Petro-Points just launched its new Facebook page! The Petro-Points Facebook page is a place for Petro-Points members to connect, interact and share tips and experiences. 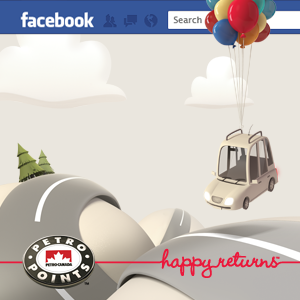 "Like" the page to keep up to date on the latest Petro-Points news, exclusive offers and awesome contests. Petro-Points is Petro-Canada’s loyalty program. Just swipe your Petro-Points card to collect points on your fuel, car wash and convenience store purchases and then you can redeem your points for all kinds of rewards, from fuel savings and car wash to travel. For instance, you can redeem Petro-Points for the Fuel Savings Reward card we feature in our Ways to Save on Fuel infographic. Not a Petro-Points member yet? It's easy to join. And if you are a member, join us on the Petro-Points Facebook page!